Rachel Vandekop is the practice manager, overseeing 3 locations including Sergeant Bluff Eye Care, Marcus Eye care, and Wayne Eye Care. In this role Rachel provides support for all 3 clinics in all areas including customer relations, accounts receivable/payable, and most importantly patient care. 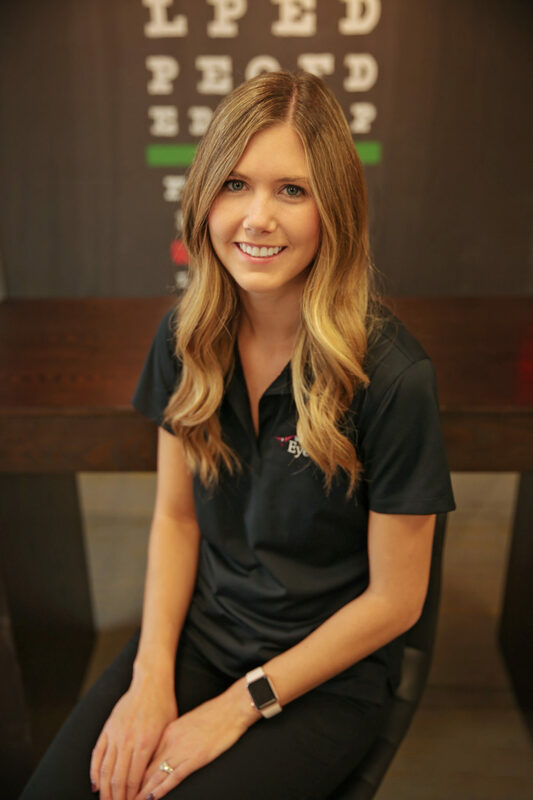 Rachel’s favorite part about working for the practice is building relationships with patients and their families year after year and watching our team continue to grow. 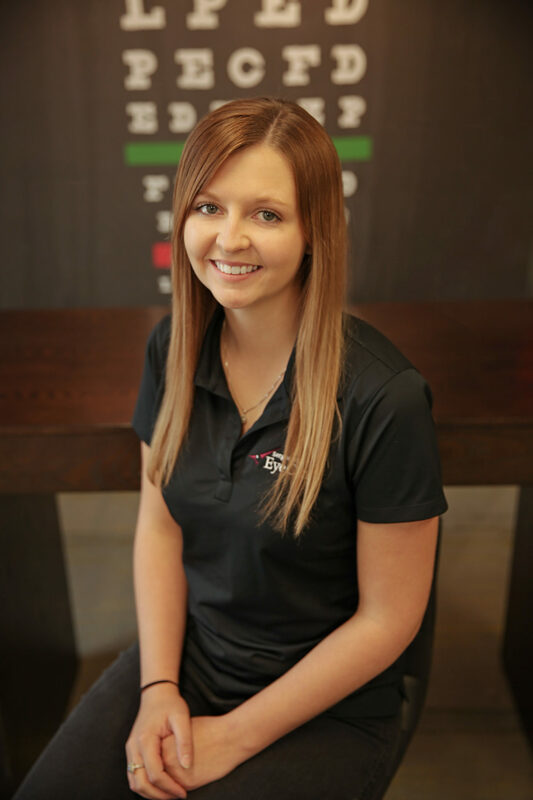 Rachel became certified shortly after starting in 2012 from the Iowa Optometric Assistants Association as a certified Para (CPO) then later attained her Certified Paraoptometric Assistants license (CPOA). In Rachel’s free time she enjoys entertaining, cooking, outdoor activities, and spending time with her husband Casey, and 2 sons Mason and Nolan. Katherine Rosenbaum has done just about everything including administrative support, optical, and billing in our Sergeant Bluff location but is now serving as our Office Manager at Wayne Eye Care. In Katherine’s role she supports customer relations, accounts receivable/payable, and optical at Wayne Eye Care. Katherine is a firm believer in quality and hard work by doing everything she can to ensure that for the patient. Katherine currently holds a Bachelor of Science Business Administration/Health Science and looking to continue her education in the future. In Katherine’s spare time she loves anything that involves the outdoors and spending time with her family including energetic daughter Madeline and fiancé Matt. Carrie Casaday is an Optical Manager/Optician at Sergeant Bluff Eyecare. 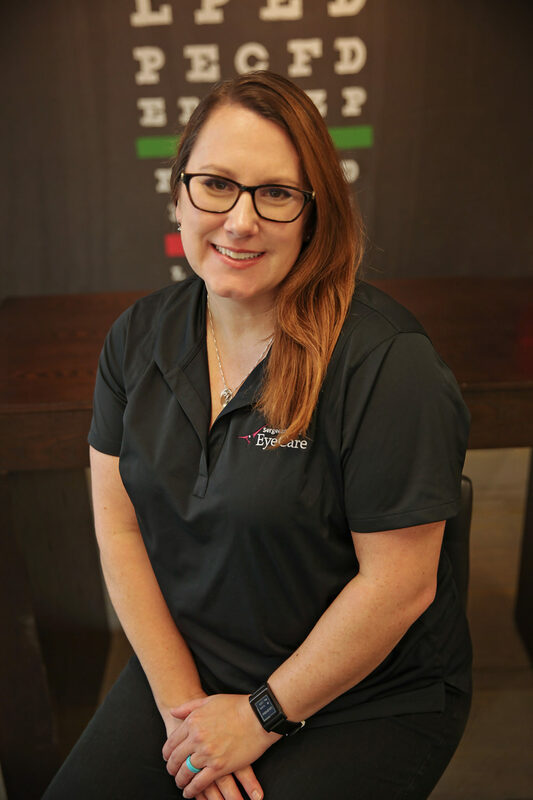 In this role Carrie ensures we have the best frame options for our patients, educating and troubleshooting any issues that arise, and coordinating with our local and insurance labs to get the best product we can deliver. In Carries free time she enjoys camping, outdoor activities, and absolutely loves spending time with her husband Patrick watching their daughter Amelia grow into a little lady. Sara Robinson has moved from our Administrative Support team at Sergeant Bluff Eyecare to Dr. Lefeber’s ophthalmic technician in both Marcus and Wayne clinics. In this role Sara is one on one with patients gathering information so we can address each patients concerns and give them the best care. Sara is a big believer in kindness and making people feel welcomed at any time in our clinic and leaving with a positive experience. Sara earned a BS degree in Biology/Chemistry from the University of Northern Iowa; she is also a certified pharmacy technician (Cpht). In Sara’s spare time she enjoys cooking, shopping, and spending time with her husband Travis and two daughters Delaney and Leah. She loves going to her daughters sporting events and any other extracurricular activities. She is an avid sport fan traveling wherever she can to see her favorite teams, Chicago Cubs, Golden State Warriors, and the Vikings. Amie Hanson is also part of our Administrative Support team/Insurance verification with Sergeant Bluff Eye Care. In this role, Amie looks after all aspects of insurance, including locating patient’s policies and verifying benefits. Amie holds 2 Associate Degrees from the Community College of the Air Force. Those degrees are in Information Technology Systems and Human Resource Management. In Amie's spare time she enjoys spending time with her husband Ron, and visiting their son, Tyler in Kansas City. Her biggest passion would be as a Volunteer, Board Member and foster home for Noah's Hope Animal Rescue, a non-profit, foster based rescue. Kristie is one of the first faces you see at our front desk. She welcomes patients with a warm smile and checks patients in for their appointments. Kristie answers the phones, sets appointments, schedules consultations, helps to manage the schedule, aids with in house marketing, and assists with contact lens ordering. Kristie has over ten years of customer service experience and enjoys getting to know the patients and their families. She is currently pursuing CPO certification to better serve the patients of Sergeant Bluff Eye Care. In her spare time Kristie enjoys spending time with her husband, Doug and daughter, Zoey. They love going to the zoo, swimming, theatre, and going on adventures! Tori is our newest Optician at Sergeant Bluff Eye Care. In this role Tori helps patients select frames that work best with their lifestyle along with adjusting them to fit properly. She genuinely enjoys helping patients make fun choices and watching them try on frames that they normally wouldn’t even think about. Tori’s favorite part of the job so far is working with a great team and supporting one another to improve our patients overall experience at our office. In Tori’s free time she enjoys anything that involves the outdoors, whether it’s yard work around the house or hunting and riding four wheelers. She and her boyfriend Mitchell have two dogs Molly and Drake. They enjoy taking them out to explore and swim when it’s warm enough. She previously was a dog groomer and will always have a sweet spot for any animal. When she has time she also enjoys spending weekends with her family in South Eastern Iowa where her parents and older sister currently live. Beth Bodlak is part of our Administrative Support team. In this role Beth works with all aspects of insurance, payments and making sure claims are followed through to the end. 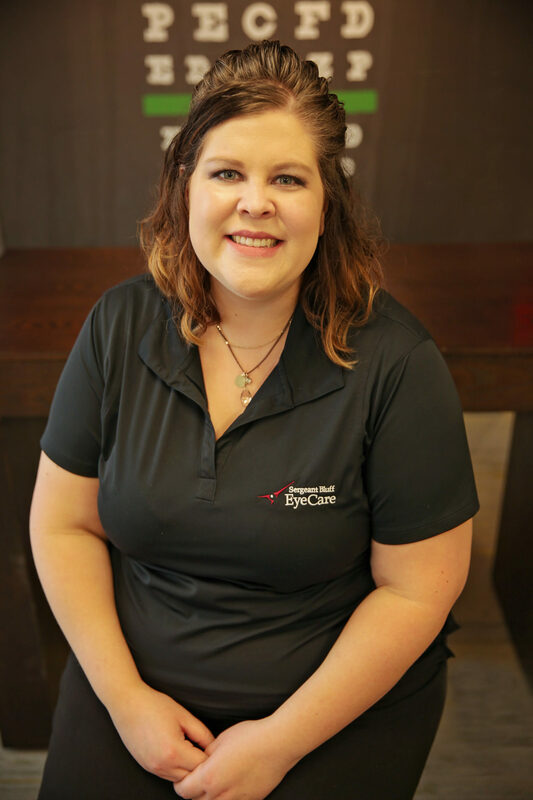 Her favorite part of working at Sergeant Bluff Eyecare is how everyone who walks through our door is treated like family, making sure each patients needs are met and questions answered. Beth enjoys shopping, going to Nebraska football games, watching sporting events her kids are involved in and spending time with her husband Tyson and their three kids, Bailie, Blake and Ben. Rachel Lindblom is part of our Administrative Support team at Sergeant Bluff Eye Care. In this role, Rachel greets patients as they enter the office and makes them feel welcome. Her responsibilities include scheduling appointments, consultations, answering the phones, upkeep of records, and managing the daily cash flow. Rachel has had several years of customer service experience and enjoys talking to the patients and getting to know them. In Rachel’s free time she enjoys entertaining, spending time with her husband Alex, spending time outdoors with her dogs, and hanging with friends and family. Amy Christenson is a part of our Administrative Support team at Sergeant Bluff Eyecare. In this role Amy works with insurance companies to insure payments are completed in a timely manner. Her favorite part of working at Sergeant Bluff Eyecare is working with a team who are dedicated to deliver excellent customer service. Amy earned a Bachelor of Arts degree in Anthropology from the University of Northern Iowa. She enjoys playing card games, biking, hiking and watching movies with her fiance’ Chuck and two sons Hayden and Henry. Millie has recently joined our team as a technician for Dr. Lefeber. In this role Millie is one on one with patients helping Dr. Lefeber gain insight on patient’s optical/medical history and any current concerns they may have when coming in for an exam. Millie is able to make each and every patient feel at ease as soon as their name is called from the waiting area just with her smile. Millie has mastered the advanced testing equipment in a matter of months and also holds her certification as a Pharmacy Technician (Cpth). Millie and her husband Jason enjoy watching their kids Ayden, Alexis, and Jordyn play in various activities including baseball, soccer, and dance. When they are able to get away from their busy schedules they also love to be outside, preferably on their ATV’s or watching Nebraska football.